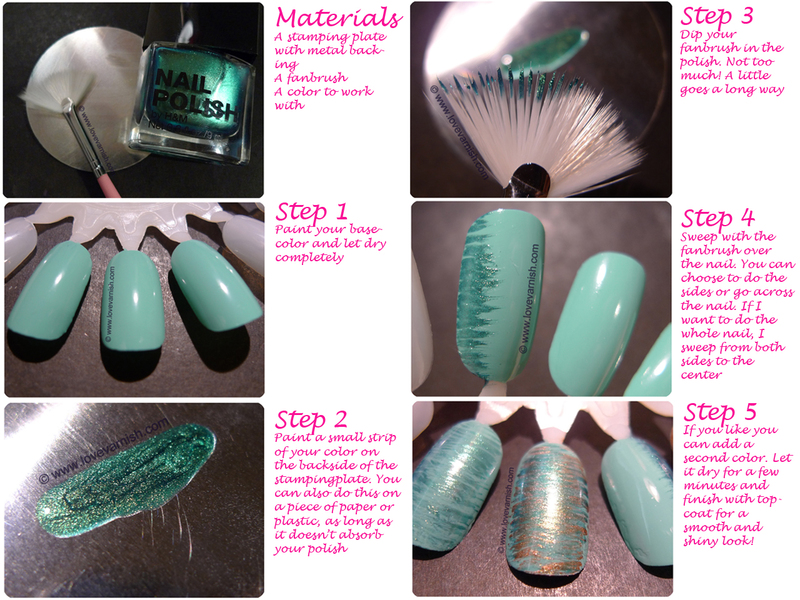 Love Varnish: My very first tutorial: How to use a fanbrush! My very first tutorial: How to use a fanbrush! Hi loves! Woah, today is a special day as I created my very first tutorial! I've been using a fanbrush lately to create some fun manicures, and I was asked to do a tutorial on the use of it. I included everything I think you should know in the picture tutorial, let me know what you think about it and if you found it useful! Also, you can click on the image to make it larger. Great Tutorial! I will have to try this. I like this idea! I'll definitely give this a try! Thanks I just got my nail art brushes in the mail and I was so unsire what to do with the fan brush and this post came just in time! Thanks, hope you like the effect! Thanks :D glad you like the tutorial. Thanks Vicky! Hope it works out for you! Thanks, I hope you enjoy your results :). That is great to hear Janelle :). You are welcome Tamara, I am glad you like the tutorial.